Such great news that Goldman Sachs and Apple are teaming up to create a new Apple credit card! 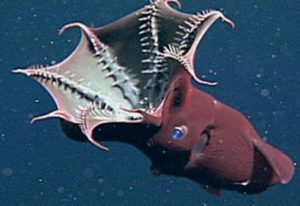 Yes, the great vampire squid that is “wrapped around the face of humanity, relentlessly jamming its blood funnel into anything that smells like money” has finally hooked up with the world’s most valuable company, in what is no doubt a sincere effort to deliver better financial products to consumers. It’s a marriage between a financial company that has suffered from bad image problems while controlling the world, with a technology company that is beloved and used by the global elites — and that has largely escaped bad press except for a few sweatshop labor scandals and complaints about battery life. Goldman is said to be working hard to build its consumer banking business, to “reduce its reliance on trading revenue in years to come.” Yet I find it hard to believe Goldman and other Wall Street banks could really be suffering so much that they are being forced to sully themselves by having to issue plastic. It’s often reported that in the aftermath of the financial crash, and with the advent of (now being repealed) tougher regulations, the bank have had to live lean. But how bad off could they really be, given that we are in the midst of what could very be another bubble market, the market in tech stocks? My back-of-the envelope calculation is that since 2006, the market capitalization of the major tech stocks has increased by 500% — from $640 billion in 2006 to $3.25 trillion today. While it’s a huge and potentially idiotic oversimplification to compare housing prices with stock prices, it’s still interesting to note that house prices increased by “only” 124% between 1997 and 2006, and in the most intense bubble years of 2001-06, and in the most hyper-inflated metro areas, home prices were up 80%.